Gionee announced its battery-focused smartphone, the Marathon 5 in June. Until now, the device was limited to China, but today, the company sent out the press invites for its India launch event. 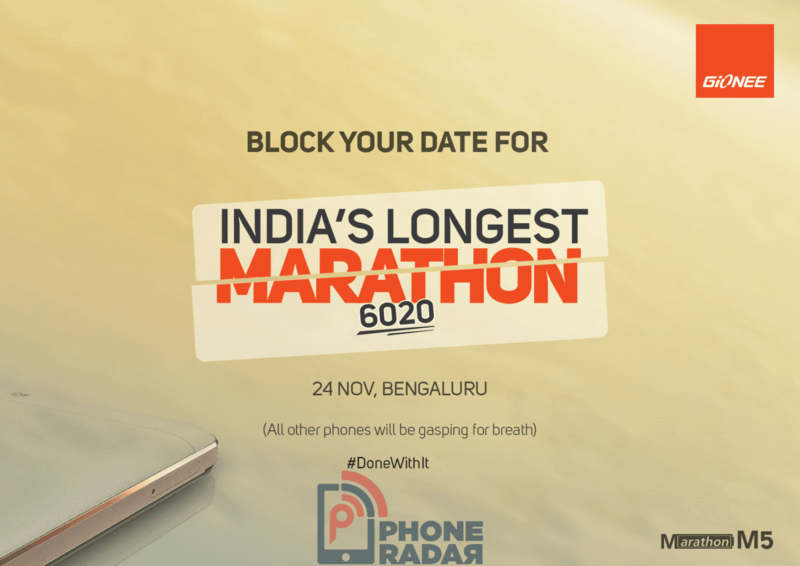 The device will go official at an event in Bengaluru on November 24. The Gionee Marathon M5 was launched at CNY 2,299 (approx Rs. 23,000) in China. We hope the company announces it at a lesser price tag than the converted rate from China pricing. The main feature of the device is its long lasting battery, which is touted by the company to last up to 4 days on a single charge. There are two 3,010mAh batteries on the rear, and the combination of both makes the battery size of 6,020mAh. There are extra features onboard that can spike the battery life even more, the ‘Extreme Mode’ feature boosts the standby time even at 5 percent battery life to whopping 62 hours. The phone is also supported by the reverse charging feature that enables users to use the Marathon M5 as a power bank to charge other devices. Battery is too much, i think they should work on giving good display and 5.0 inch screen size with good performance. batery of 4000 is more than enough if it lasts more than 1.5 days.